This premium Kleenex Ultra hand towel roll provides a quality, caring hand drying experience for use in shared washrooms. The compact, slim design is ideal for use where space may be limited. 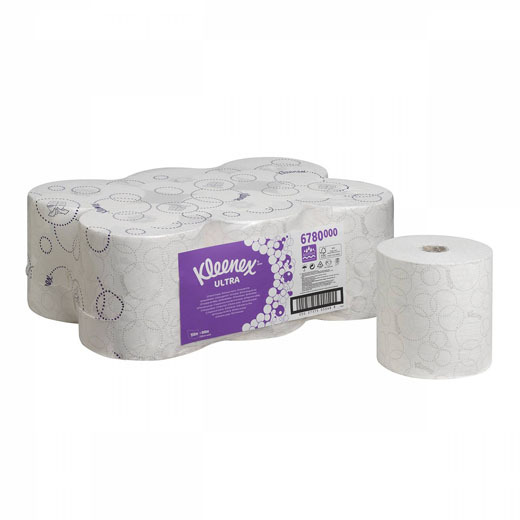 Made using unique Airflex technology, the 2 ply roll is soft and highly absorbent. For uncompromised care, every single time, our the Kleenex Ultra Slimroll hand towel pairs with our compact dispenser to deliver premium comfort and exceptional employee care. Ideal for environments where space may be limited (e.g. offices or lodging), that want to provide the most caring rolled hand drying experience preferred by washroom users. Kleenex's unique Airflex Technology ensures that each towel is ultra absorbent, especially when compared to conventional paper towels. Airflex fabric remains strong when wet, preventing it from becoming soggy and ripping, whilst retaining its soft and comforting texture. This product is sold as 6 x 100m =2,400 sheets, white, 2 ply SLIMROLL rolled hand towels (600m total). Individual sheet size 19.8cm wide.